Volkswagen has released details of the forthcoming Golf GTE, ahead of its public unveiling at next month's Geneva Motor Show. The new model is the German marque's second plug-in hybrid offering, following on from the groundbreaking (and strictly limited) XL1, which was launched last year. The new petrol-electric drivetrain joins a model line-up that now sees the Golf offered in petrol, diesel, natural gas (not in the UK), electric and hybrid guises. Badged the GTE, Volkswagen claims it will offer the same levels of dynamism as the performance oriented GTI and GTD models. It certainly has the grunt to hold its head high among its conventionally powered stable-mates. The GTE uses a 148bhp 1.4-litre turbocharged engine, mated to a 100bhp electric motor. Total combined power is 201bhp – only just shy of the 217bhp developed by the Golf GTI's 2.0-litre turbocharged motor. The power is sent to the front wheels through a six-speed DSG automatic gearbox, which has been developed with three separate clutches for use with the hybrid drivetrain. Despite weighing nearly 200kg more than its petrol-powered sibling, the GTE puts in some credible performance figures, with Volkswagen claiming it will hit 62mph from a standstill in 7.6 seconds and go on to a top speed of 135mph. Despite this – and thanks to the GTE's ability to run solely on battery power for up to 31 miles – the car's claimed fuel economy and CO2 emissions figures are impressively low, at 188mpg and 35g/km respectively. Drivers can choose between hybrid and pure-electric power at the push of a button. The on-board 8.8kWh battery takes around three-and-a-half hours to fully charge from a domestic mains outlet. Visually, the GTE closely resembles the petrol-powered GTI, with subtly pumped-up front and rear bumpers and twin exhaust pipes. It sits on 18-inch alloy wheels as standard and will be available as a five-door model only. Inside, the GTE features blue highlights in place of the GTI's red detailing, to denote its part electric drivetrain. This includes the pattern of the tartan upholstery, which has been a staple feature of performance Golfs since their introduction in 1976. 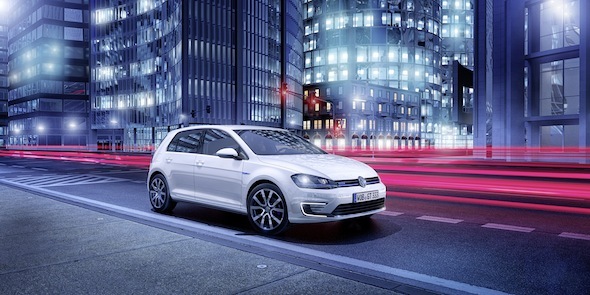 The Golf GTE will make it to UK showrooms late in August, with the first customer cars expected for delivery in December. Prices have not yet been confirmed but a list price of around £28,000 (including a £5,000 government grant) is predicted.